If a plant is listed as hardy in USDA Zones 5-8, how can you tell if it will survive in your garden? The USDA (United States Department of Agriculture) has adopted a map, which shows the expected high and low temperatures for a given area. The zones are divided on this map and numbered. It is based on the coldest climate in which a plant will survive. If a plant is listed as hardy in zones 5-8, it means that it will withstand the cold temperatures up to zone 5 but will most likely freeze out in lower zones such as 2, 3, and 4. It also shows that it will withstand the heat up to zone 8 but will probably die out in a hotter climate of 9, 10, and 11. The best growing conditions for this plant would be between and including zones 5-8. It isn't a perfect system but it does give gardeners an idea of where a plant will grow and thrive. 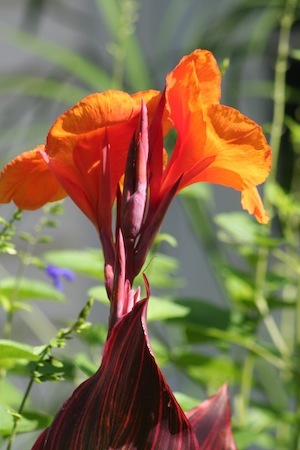 For instance, you can leave the canna (pictured here) in the ground in zones 7-11 but you need to dig the rhizomes and store them indoors in the colder zones of 3-6. It would be listed as hardy in USDA Zones 7-11. Follow Anne K Moore as she blogs along with Linda Weiss at Diggin’ It at the Christian Science Monitor website. and at their website: The Gardener and the Chef.